On the occasion of Queens International 2018: Volumes, mother Liz Phillips and daughter Heidi Howard present their first artistic collaboration, Relative Fields in a Garden. A multimedia installation, the work combines Howard’s vivid, gestural portraiture on the surface of the 40-foot wall with Phillips’ sound work, which creates interactive sound fields using wave transmissions. It remains on view as part of Queens Museum’s Large Wall series, featuring year-long commissions by women-identified artists. The combination of image and sound includes fantastical flora and field recordings that bridge representation and abstraction, in a tender depiction of three generations of women and Phillips’ own Sunnyside, Queens garden as it transitions through the seasons. Mother and daughter collaborated on 3D elements such as ceramic flowers, bamboo, and birch veneer which animate the painting aurally as well as visually with tactile sound from Phillips’ transducers. Furthering exploring interactions between sensory information, Phillips’ composition of the sounds of wildlife, running water, leaves rustling, and city noises such as garbage pickup also responds to the passage of sunlight across the wall through the use of sensors. The mother and daughter worked simultaneously. 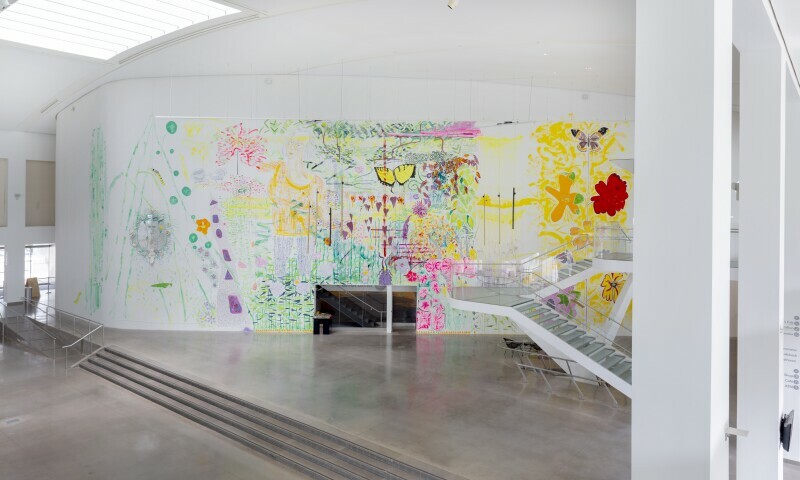 Howard invoked a synaesthetic approach–in which she related her brushstrokes and color choices to the experience of hearing Phillips’ sound selections as they played in the atrium of the museum. Both artists convey their perception of physical and emotional environments, transmuted through their respective sensibilities and mediums. They invite us to sit in three garden chairs previously owned by Phillips’ mother Geraldine, vibrating with sounds of the river she loved; here we can consider the domestic sphere of the garden and its politics of relation and simultaneity— embodying care and control, unruliness and collaboration, work and pleasure, growth and decline.